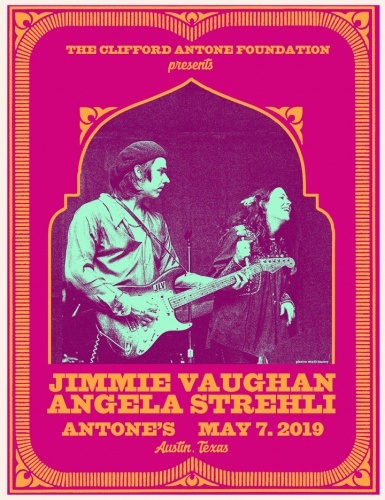 The Clifford Antone Foundation is excited to host our Spring Members Event on Tuesday, May 7th at Antone’s Nightclub with musical performances by two of the club’s most notable legends, Jimmie Vaughan and Angela Strehli. Few artists made a larger impact at Antone’s first location – not to mention the club’s eventual success in spreading blues around the globe. As the Clifford Antone Foundation prepares to announce a huge project in the spirit of the original club, there are no better artists to play our next members event than these two musical icons. You won’t want to miss this momentous occasion! This is a members-only event. Become a member now right on our website! A 501(c)(3) non-profit in Austin, Texas dedicated to preserving our music culture and community by caring for our elders and investing in our youth.